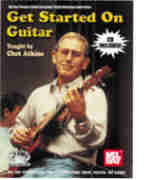 "The heart of this guitar course is the true love of the instrument that Chet Atkin's good-natured presence projects. His enthusiasm is infectious and his legendary mastery is evident in the beautiful simplicity with which an enormous amount of information is conveyed," says New Video Review. If you're serious about learning to play the guitar, now you can learn all of the basics and a lot more from the master himself. The video was originally released in 1986 and we are very happy to offer it now in book form. You'll have hours of fun playing along with Chet on songs like Yesterday; Jambalaya; Country Roads; and New Guitar Blues. For each song you'll learn the chords, the melody, plus some of Chet's hottest licks. Tips on tuning, changing chords, fingerpicking, and much more are carefully explained. The book's companion CD presents phrase- by-phrase instruction (identical to the video of the same title).